This article is about Buddhism. For the 2010 film, see Bodhisattva (film). For the song by Steely Dan, see Countdown to Ecstasy. In Buddhism, a Bodhisattva (/ˌboʊdiːˈsʌtvə/ BOH-dee-SUT-və) is any person who is on the path towards Buddhahood but has not yet attained it. In Mahayana Buddhism, a bodhisattva refers to anyone who has generated bodhicitta, a spontaneous wish and compassionate mind to attain Buddhahood for the benefit of all sentient beings. Gandharan relief depicting the bodhisatta (future Gautama Buddha) taking a vow at the foot of Dipankara Buddha, Art Institute of Chicago. Probable early image of a Bodhisattva (Bimaran casket, 50 CE). Modern depiction of the bodhisatta resolution (praṇidhāna) in front of Dipankara. Bronze statue of the bodhisatta Avalokiteśvara. Sri Lanka, ca. 750 CE. In early Buddhism, the term bodhisatta is used in the early texts to refer to Gautama Buddha in his previous lives and as a young man in his current life in the period during which he was working towards his own liberation. During his discourses, to recount his experiences as a young aspirant he regularly uses the phrase "When I was an unenlightened bodhisatta..." The term therefore connotes a being who is "bound for enlightenment", in other words, a person whose aim is to become fully enlightened. In the Pāli canon, the bodhisatta is also described as someone who is still subject to birth, illness, death, sorrow, defilement, and delusion. Some of the previous lives of the Buddha as a bodhisattva are featured in the Jataka tales. According to the Theravāda monk Bhikkhu Bodhi, the bodhisattva path is not taught in the earliest strata of Buddhist texts such as the Pali Nikayas (and their counterparts such as the Chinese Āgamas) which instead focus on the ideal of the Arahant. The oldest known story about how Gautama Buddha becomes a bodhisattva is the story of his encounter with the previous Buddha, Dīpankara. During this encounter, a previous incarnation of Gautama, variously named Sumedha, Megha, or Sumati offers five blue lotuses and spreads out his hair or entire body for Dīpankara to walk on, resolving to one day become a Buddha. Dīpankara then confirms that they will attain Buddhahood. Early Buddhist authors saw this story as indicating that the making of a resolution (abhinīhāra) in the presence of a living Buddha and his prediction/confirmation of one's future Buddhahood was necessary to become a bodhisattva. According to Drewes, "all known models of the path to Buddhahood developed from this basic understanding." The path is explained differently by the various Nikaya schools. In the Theravāda Buddhavaṃsa (1st-2nd century BCE), after receiving the prediction, Gautama took four asaṃkheyyas (‘incalculable aeons’) and a hundred thousand, shorter kalpas (aeons) to reach Buddhahood. Natural (prakṛti), one first plants the roots of merit in front of a Buddha to attain Buddhahood. Resolution (praṇidhāna), one makes their first resolution to attain Buddhahood in the presence of a Buddha. Continuing (anuloma), one continues to practice until one meets a Buddha who confirms one's future Buddhahood. Irreversible (anivartana), at this stage, one cannot fall back. The Sri Lankan commentator Dhammapala in his commentary on the Cariyāpiṭaka, a text which focuses on the bodhisatta path, notes that to become a bodhisatta one must make a valid resolution in front of a living Buddha, which confirms that one is “irreversible” (anivattana) from the attainment of Buddhahood. The Nidānakathā, as well as the Buddhavaṃsa and Cariyāpiṭaka commentaries makes this explicit by stating that one cannot use a substitute (such as a Bodhi tree, Buddha statue or Stupa) for the presence of a living Buddha, since only a Buddha has the knowledge for making a reliable prediction. This is the generally accepted view maintained in orthodox Theravada today. The idea is that any resolution to attain Buddhahood may easily be forgotten or abandoned during the aeons ahead. The Burmese monk Ledi Sayadaw (1846–1923) explains that though it is easy to make vows for future Buddhahood by oneself, it is very difficult to maintain the necessary conduct and views during periods when the Dharma has disappeared from the world. One will easily fall back during such periods and this is why one is not truly a full bodhisatta until one receives recognition from a living Buddha. Because of this, it was and remains a common practice in Theravada to attempt to establish the necessary conditions to meet the future Buddha Maitreya and thus receive a prediction from him. Medieval Theravada literature and inscriptions report the aspirations of monks, kings and ministers to meet Maitreya for this purpose. Modern figures such as Anagarika Dharmapala (1864–1933), and U Nu (1907–1995) both sought to receive a prediction from a Buddha in the future and believed meritorious actions done for the good of Buddhism would help in their endeavor to become bodhisattas in the future. Over time the term came to be applied to other figures besides Gautama Buddha in Theravada lands, possibly due to the influence of Mahayana. The Theravada Abhayagiri tradition of Sri Lanka practiced Mahayana Buddhism and was very influential until the 12th century. Kings of Sri Lanka were often described as bodhisattvas, starting at least as early as Sirisanghabodhi (r. 247-249), who was renowned for his compassion, took vows for the welfare of the citizens, and was regarded as a mahāsatta (Sanskrit mahāsattva), an epithet used almost exclusively in Mahayana Buddhism. Many other Sri Lankan kings from the 3rd until the 15th century were also described as bodhisattvas and their royal duties were sometimes clearly associated with the practice of the Ten Pāramitās. In some cases, they explicitly claimed to have received predictions of Buddhahood in past lives. Theravadin bhikkhu and scholar Walpola Rahula stated that the bodhisattva ideal has traditionally been held to be higher than the state of a śrāvaka not only in Mahayana but also in Theravada Buddhism. He also quotes the 10th century king of Sri Lanka, Mahinda IV (956-972 CE), who had the words inscribed "none but the bodhisattvas will become kings of a prosperous Lanka," among other examples. But the fact is that both the Theravada and the Mahayana unanimously accept the Bodhisattva ideal as the highest...Although the Theravada holds that anybody can be a Bodhisattva, it does not stipulate or insist that all must be Bodhisattva which is considered not practical. Jeffrey Samuels echoes this perspective, noting that while in Mahayana Buddhism the bodhisattva path is held to be universal and for everyone, in Theravada it is "reserved for and appropriated by certain exceptional people." Paul Williams writes that some modern Theravada meditation masters in Thailand are popularly regarded as bodhisattvas. Mahāyāna Buddhism (often also called Bodhisattvayāna, or the "Bodhisattva Vehicle") is based principally upon the path of a bodhisattva. This path was seen as nobler than becoming an arhat or a solitary Buddha. According to David Drewes, "Mahayana sutras unanimously depict the path beginning with the first arising of the thought of becoming a Buddha (prathamacittotpāda), or the initial arising of bodhicitta, typically aeons before one first receives a Buddha’s prediction, and apply the term bodhisattva from this point." The Aṣṭasāhasrikā Prajñāpāramitā Sūtra, one of the earliest known Mahayana texts, contains a simple and brief definition for the term bodhisattva, which is also the earliest known Mahāyāna definition. This definition is given as the following: "Because he has bodhi as his aim, a bodhisattva-mahāsattva is so called." When Mahāyāna sūtras present stories of Buddhas and bodhisattvas’ first arising of the thought of attaining Buddhahood, they invariably depict it as taking place in the presence of a Buddha, suggesting that they shared with all known nikāya traditions the understanding that this is a necessary condition for entering the path. In addition, though this key fact is often obscured in scholarship, they apparently never encourage anyone to become a bodhisattva or present any ritual or other means of doing so. Like nikāya texts, they also regard the status of new or recent bodhisattvas as largely meaningless. The Aṣṭasāhasrikā, for instance, states that as many bodhisattvas as there grains of sand in the Ganges turn back from the pursuit of Buddhahood and that out of innumerable beings who give rise to bodhicitta and progress toward Buddhahood, only one or two will reach the point of becoming irreversible. Drewes also adds that early texts like the Aṣṭasāhasrikā treat bodhisattvas who are beginners (ādikarmika) or "not long set out in the [great] vehicle" with scorn, describing them as "blind", "unintelligent", "lazy" and "weak". 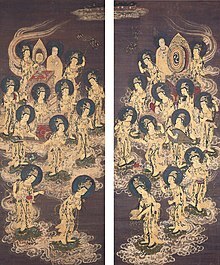 Early Mahayana works identify them with those who reject Mahayana or who abandon Mahayana, and they are seen as likely to become śrāvakas (those on the arhat path). Rather than encouraging them to become bodhisattvas, what early Mahayana sutras like the Aṣṭa do is to help individuals determine if they have already received a prediction in a past life, or if they are close to this point. The Aṣṭa provides a variety of methods, including forms of ritual or divination, methods dealing with dreams and various tests, especially tests based on one's reaction to the hearing of the content in the Aṣṭasāhasrikā itself. The text states that encountering and accepting its teachings mean one is close to being given a prediction and that if one does not "shrink back, cower or despair" from the text, but "firmly believes it", one is irreversible. Many other Mahayana sutras such as the Akṣobhyavyūha and the Śūraṃgamasamādhi Sūtra present textual approaches to determine one's status as an advanced bodhisattva. These mainly consist in one's attitude towards listening to, believing, preaching, proclaiming, copying or memorizing and reciting the sutra. According to Drewes, this claim that merely having faith in Mahāyāna sūtras meant that one was an advanced bodhisattva, was a departure from previous Nikaya views about bodhisattvas. It created new groups of Buddhists who accepted each other's bodhisattva status. Some of early depictions of the Bodhisattva path in texts such as the Ugraparipṛcchā Sūtra describe it as an arduous, difficult monastic path suited only for the few which is nevertheless the most glorious path one can take. Three kinds of Bodhisattvas are mentioned: the forest, city, and monastery Bodhisattvas - with forest dwelling being promoted a superior, even necessary path in sutras such as the Ugraparipṛcchā and the Samadhiraja sutras. The early Rastrapalapariprccha sutra also promotes a solitary life of meditation in the forests, far away from the distractions of the householder life. The Rastrapala is also highly critical of monks living in monasteries and in cities who are seen as not practicing meditation and morality. The Ratnagunasamcayagatha also says the Bodhisattva should undertake ascetic practices (dhutanga), "wander freely without a home", practice the paramitas and train under a guru in order to perfect his meditation practice and realization of prajñaparamita. Some scholars have used these texts to argue for "the forest hypothesis", the theory that the initial Bodhisattva ideal was associated with a strict forest asceticism. But other scholars point out that many other Mahayana sutras do not promote this ideal, focusing on sutra based practices. Some Mahayana sutras promoted another revolutionary doctrinal turn, claiming that the three vehicles of the Śrāvakayāna, Pratyekabuddhayāna and the Bodhisattvayāna were really just one vehicle (ekayana). This is most famously promoted in the Lotus Sūtra which claims that the very idea of three separate vehicles is just an upaya, a skillful device invented by the Buddha to get beings of various abilities on the path. But ultimately, it will be revealed to them that there is only one vehicle, the ekayana, which ends in Buddhahood. Contemporary Mahāyāna Buddhism follows this model and encourages everyone to give rise to bodhicitta and ceremonially take bodhisattva vows. With these vows, one makes the promise to work for the complete enlightenment of all sentient beings by practicing the transcendent virtues or paramitas. Related to the different views on the different types of yanas or vehicles is the question of a bodhisattva's relationship to nirvāṇa. In the various Mahāyāna texts, two theories can be discerned. One view is the idea that a bodhisattva must postpone their awakening until full Buddhahood is attained (at which point one ceases to be reborn, which is the classical view of nirvāṇa). This view is promoted in some sutras like the Pañcavimsatisahasrika-prajñaparamita-sutra. The second theory is the idea that there are two kinds of nirvāṇa, the nirvāṇa of an arhat and a superior type of nirvāṇa called apratiṣṭhita (non-abiding) that allows a Buddha to remain engaged in the world. This doctrine developed in Yogacara. As noted by Paul Williams, the idea of apratiṣṭhita nirvāṇa may have taken some time to develop and is not obvious in some of the early Mahāyāna literature, therefore while earlier sutras may sometimes speak of "postponement", later texts saw no need to postpone the "superior" apratiṣṭhita nirvāṇa. In this Yogacara model, the bodhisattva definitely rejects and avoids the liberation of the śravaka and pratyekabuddha, described in Mahāyāna literature as either inferior or "Hina" (as in Asaṅga's fourth century Yogācārabhūmi) or as ultimately false or illusory (as in the Lotus Sūtra). That a bodhisattva has the option to pursue such a lesser path, but instead chooses the long path towards Buddhahood is one of the five criteria for one to be considered a bodhisattva. The other four are: being human, being a man, making a vow to become a Buddha in the presence of a previous Buddha, and receiving a prophecy from that Buddha. King-like bodhicitta - To aspire to become a Buddha first in order to then help sentient beings. Boatman-like bodhicitta - To aspire to become a Buddha at the same time as other sentient beings. Shepherd-like bodhicitta - To aspire to become a Buddha only after all other sentient beings have done so. These three are not types of people, but rather types of motivation. According to Patrul Rinpoche, the third quality of intention is most noble though the mode by which Buddhahood actually occurs is the first; that is, it is only possible to teach others the path to enlightenment once one has attained enlightenment oneself. The ritualized formulation of the bodhisattva vow also reflects this order (becoming a buddha so that one can then teach others to do the same). A bodhisattva vow ritual text attributed to Nāgārjuna, of the second-third century CE, states the vow as follows: "Just as the past tathāgata arhat samyaksambuddhas, when engaging in the behavior of a bodhisattva, generated the aspiration to unsurpassed complete enlightenment so that all beings be liberated, all beings be freed, all beings be relieved, all beings attain complete nirvana, all beings be placed in omniscient wisdom, in the same way, I whose name is so-and-so, from this time forward, generate the aspiration to unsurpassed complete enlightenment so that all beings be liberated, all beings be freed, all beings be relieved, all beings attain complete nirvana, all beings be placed in omniscient wisdom." The six perfections that constitute bodhisattva practice should not be confused with the actual acts of benefiting beings that the bodhisattva vows to accomplish once he or she is a buddha. The six perfections are a mental transformation and need not actually benefit anyone. This is seen in the story of Vessantara, an incarnation of Śākyamuni Buddha while he was still a bodhisattva, who commits the ultimate act of generosity by giving away his children to an evil man who mistreats them. Vessantara's generous act causes indirect harm, however, the merit from the perfection of his generosity fructifies when he attains complete enlightenment as Śākyamuni Buddha. Luminous: The light of Dharma is said to radiate for others from the bodhisattva who accomplishes the third bhūmi. The emphasized perfection is patience (kṣānti). Radiant: This bhūmi it is said to be like a radiating light that fully burns that which opposes enlightenment. The emphasized perfection is vigor (vīrya). Very difficult to train: Bodhisattvas who attain this ground strive to help sentient beings attain maturity, and do not become emotionally involved when such beings respond negatively, both of which are difficult to do. The emphasized perfection is meditative concentration (dhyāna). Gone afar: Particular emphasis is on the perfection of skillful means (upāya), to help others. Immovable: The emphasized virtue is aspiration. This "immovable" bhūmi is where one becomes able to choose his place of rebirth. Good Discriminating Wisdom: The emphasized virtue is the understanding of self and non-self. With the 52 stages, the Śūraṅgama Sūtra recognizes 57 stages. With the 10 grounds, various Vajrayāna schools recognize 3–10 additional grounds, mostly 6 more grounds with variant descriptions. A bodhisattva above the 7th ground is called a mahāsattva. Some bodhisattvas such as Samantabhadra are also said to have already attained buddhahood. Some sutras said a beginner would take 3–22 countless eons (mahāsaṃkhyeya kalpas) to become a buddha. Pure Land Buddhism suggests buddhists go to the pure lands to practice as bodhisattvas. Tiantai, Huayan, Zen and Vajrayāna schools say they teach ways to attain buddhahood within one karmic cycle. Various traditions within Buddhism believe in specific bodhisattvas. Some bodhisattvas appear across traditions, but due to language barriers may be seen as separate entities. For example, Tibetan Buddhists believe in various forms of Chenrezig, who is Avalokiteśvara in Sanskrit, Guanyin in China, Gwan-eum in Korea, Quan Am in Vietnam, and Kannon in Japan. Followers of Tibetan Buddhism consider the Dalai Lamas and the Karmapas to be an emanation of Chenrezig, the Bodhisattva of Compassion. In this order: Compassion, Wisdom, Vow and Practice. Mural of bodhisattvas. China, Tang Dynasty, 7th-9th century. Boddhisattva Vajrapani. Mendut near Borobudur, Central Java, Indonesia. Sailendran art c. 8th century. A bronze boddhisattva Maitreya. Komering, Palembang, Indonesia. Srivijayan art c. 9th-10th century. 9th century CE Srivijayan art, Chaiya, Surat Thani, Southern Thailand. Seated Bodhisattva Avalokitesvara (Guanyin), wood and pigment, 11th century, Chinese Northern Song dynasty, St. Louis Art Museum. Gold coated bronze statue of Avalokitesvara in Malayu-Srivijayan style c. 11th century, Jambi, Sumatra, Indonesia. Youthful Mañjuśrī Bodhisattva silver statue. Java, 9th century Indonesia. Maitreya Bodhisattva. Thiksey Monastery, Ladakh, India. "Standing Bodhisattva" (pre-1234). Brooklyn Museum, New York City. Daizuigu Mahapratisara Bodhisattva. Guimet Museum. Shrine with an Image of a Bodhisattva. Brooklyn Museum. ^ "Bodhisattva". Collins English Dictionary. ^ a b c d e f g h i j k l m n o p q Drewes, David, Mahāyāna Sūtras and Opening of the Bodhisattva Path, Paper presented at the XVIII the IABS Congress, Toronto 2017, Updated 2019. ^ "Arahants, Bodhisattvas and Buddhas". ^ Hoiberg, Dale H., ed. (2010). "Abhayagiri". Encyclopædia Britannica. I: A-ak Bayes (15th ed.). Chicago, Illinois: Encyclopædia Britannica Inc. p. 30. ISBN 978-1-59339-837-8. ^ Rahula, Walpola. "Bodhisattva Ideal in Buddhism (from Gems of Buddhist Wisdom)". Buddhist Missionary Society, 1996. ^ Williams, Paul. Mahāyāna Buddhism: The Doctrinal Foundations. Taylor & Francis, 1989, page 328. ^ Ray, Reginald. Buddhist saints in India, page 252. ^ Ray, Reginald. Buddhist saints in India, page 265. ^ Ray, Reginald. Buddhist saints in India, page 255. ^ Williams, Paul, Mahayana Buddhism: The Doctrinal Foundations, Routledge, 2008, p. 55. ^ Williams, Paul, Mahayana Buddhism: The Doctrinal Foundations, Routledge, 2008, p. 195-196. ^ Har Dayal, The Bodhisattva Doctrine in Buddhist Sanskrit Literature, Motilal Banarsidass Publ., 1999, p. 54. ^ a b Williams, Paul, Mahayana Buddhism: The Doctrinal Foundations, Routledge, 2008, pp. 59-60. ^ "bodhisattva" In The Princeton Dictionary of Buddhism (Princeton: Princeton University Press, 2013), 135. ^ Words of My Perfect Teacher: A Complete Translation of A Classic Introduction to Tibetan Buddhism. Translated by The Padmakara Translation Group. (Walnut Creek: Altamira, 1994), 218. ^ "Vessantara" In The Princeton Dictionary of Buddhism (Princeton: Princeton University Press, 2013), 965. ^ "ԲϢ - Ŀ ļ". Archived from the original on 8 September 2015. Retrieved 21 August 2015. ^ 鄔金旺度. "吉祥鄔金密嚴寺". Retrieved 21 August 2015. ^ "顯教與密教". Retrieved 21 August 2015. Wikimedia Commons has media related to Bodhisattva. Bodhisattva, probably Avalokiteshvara (Guanyin), Northern Qi dynasty, c. 550--60, video, Smarthistory. The 37 Practices of Bodhisattvas online with commentaries. Audio recitation of 'The 37 Practices of Bodhisattvas' in MP3 format (Paul & Lee voices).